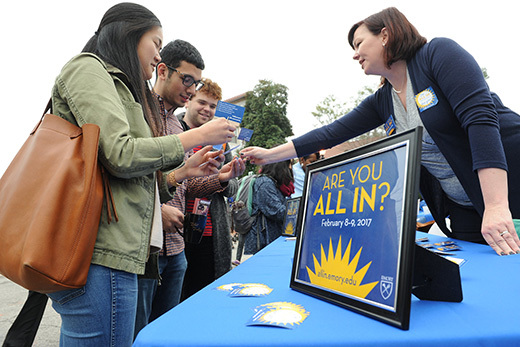 Wonderful Wednesday participants included "All in a Day," a 24-hour Emory fundraising campaign which kicked off at noon Feb. 8, immediately following President Sterk's inauguration. Zachary Wenz first encountered Emory President Claire E. Sterk this summer. Two Emory students had been killed during a terror attack in Dhaka, Bangladesh. Although Sterk wouldn’t officially assume the role of Emory president until Sept. 1, she spoke at the Oxford College campus memorial service for Abinta Kabir and Faraaz Hossain in August. Most students celebrating the inaugural-themed Wonderful Wednesday — held right after Sterk's formal inauguration ceremony — echoed those themes, both of Emory’s role in the world and Sterk’s position as the university’s leader. The weekly tradition harkens back to the years when Emory didn’t have classes on Wednesday. While the mid-week break lasted only from 1967 to 1982, Wonderful Wednesday was revived in 2006 as a student-led gathering featuring activities and information from a variety of groups. Waiting in line for free panini sandwiches and meeting with groups from the anime club to prehealth mentoring, students said they are excited to be part of Emory installing its 20th president, who is also the university's first female and first foreign-born president (she is a native of the Netherlands). Now he is hopeful that, in the wake of federal travel restrictions on those from seven mostly Muslim countries and worries about the fate of undocumented students studying on campus, she will do more. Other students said they are excited about Sterk’s leadership because she has been such a visible presence on campus throughout her first semester at the helm. Some students recalled meeting her on Move-in Day, while others reported her stopping by to have coffee with international students. Sterk's call to emphasize the undergraduate experience is especially encouraging, several students said. As a public health researcher and Emory’s first president who is a social scientist, she also has the ability to remake the stereotype of Emory undergrads as all pre-med or business students, they said. At the same time, the push for “one Emory” community should open new opportunities for undergraduates and those in the professional and graduate schools to work more together. “We want more of a focus on the liberal arts because we have a litany of things to offer,” says Dwitiya Sapre, a junior majoring in psychology. Junior Chiara Gonzales-Portillo, a neuroscience and behavioral biology major, agrees. “No other president has mentioned the undergraduate experience, and that brings more of a focus to us,” she says. Students also cited a need to prioritize scholarships and continue to be forward-looking. For instance, Wenz’s quantitative social sciences major has existed only since 2014. He describes it as a liberal arts take on data sciences. A career working on data analysis for a nonprofit is, he hopes, in his future.